5 Duncan Street, Huntsville | Team Grainger - Serving Lake of Bays, Huntsville & Muskoka for all Real Estate needs. Welcome to 5 Duncan Street, a fabulous family home close to downtown Huntsville. Enjoy the convenience of in town living while taking advantage of being on the doorstep to all of Muskoka’s natural wonders! Freshly updated this home features stunning hardwood throughout the 3 bedrooms. The gorgeous hardwood flooring continues throughout the large kitchen / dining room combo with a walk out to the backyard deck perfect for barbecuing. A large and bright living room complete with a gas stove, provides a wonderful space for the family to reconnect at the end of the day. 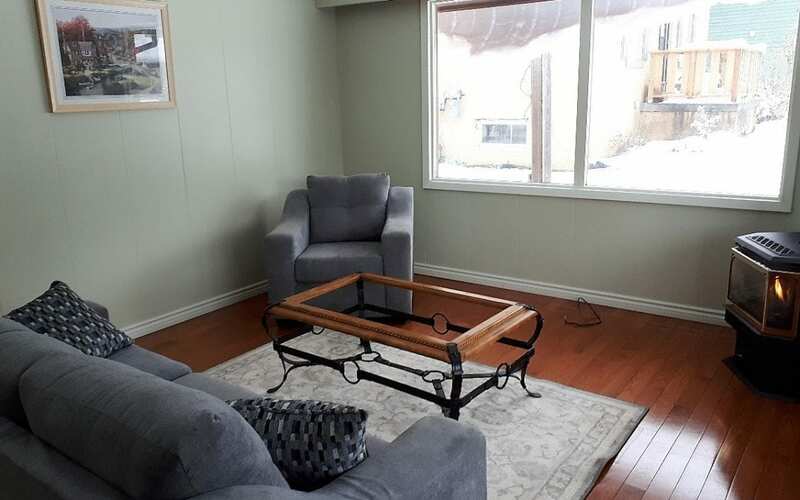 The large finished basement features a large recreation room with a gas fireplace, 3 piece washroom / laundry room and an extra bedroom for guests. A separate entrance offers potential for an in-law suite. An attached garage and backyard shed provide ample storage space. Close to dining, schools, the Summit Centre, Huntsville Public Library, shopping, transit, the theatres & public beaches, 5 Duncan Street is also just a short drive to world famous Algonquin Park, Arrowhead Provincial Park, ski hills, golf and many of Muskoka’s hiking & biking trails. All this for under $300,000 – don’t miss your opportunity – call the Grainger Team today and book your showing.